L’audience au cours de laquelle Ali Ewado devait être jugé en urgence absolue, trois jours après sa première comparution, a été reportée à une date ultérieure. Le Tribunal s’est rendu aux aguments présentés par son avocat, membre d’ASF, qui sollicitait par courrier un report pour avoir le temps d’étudier le dossier et d’organiser un déplacement à Djibouti, puisqu’aucun avocat djiboutien n’a accepté d’assurer sa défense. Selon certaines sources généralement bien informées, le bouffon attitré de la Cour, « le Rigoletto djiboutien », Hachi Abdillahi Orah aurait reçu une mission de première importance. Il doit convoyer la somme de 12.000 US$ qui est attribuée par le Prince de Pacotilles à ses représenants à Ottawa, à charge pour eux d’organiser une grande fête de remerciements pour toutes celles et tous ceux qui ont fait campagne et qui ont bien voté en sa faveur. Ca ferait un peu désordre ! The people of Djibouti are yearning for immediate change and have great endurance to carry out every possibility to over throw the totalitarian dictator and is a national obligation to every Djiboutian and in particular every Afar and Issa. Everything is from something and is related to everything else. The totalitarian dictatorship governance which is the mother of the injustice, inequality and all the problems prevailing in the Everything country that makes it assume the nation and the government as if it is his patrimonial cynic property which he manipulates as he pleases and does everything reckless about the people and about consequences have had resulted from the long silence and non-reaction of the community against his irresponsible ,nepotism governance. The reason for the struggle of the independent was not to substitute the colonial governor with a local one. But it has been to establish a frame work for national responsibility, equality and justice that could enable the community to recognize and solve their problems, the problems of the country and meet their national obligations, through dialogue based on mutual consultations and to have an effective, responsible and accountable government that respects the constitution and uses it power as entrusted by the community. Things do not always run or happen as hoped and expected. The hope and the expectation of the community has not happened as forecasted. It has became the substitution of the colonial governor to a local except the esteemed honorable flag which the leader entrusted was made not to materialize the independent the flag stands for the betterment of the community by the actual totalitarian dictator IOG who as a close relative and a president behind the curtain lead the governance to the wrong way . We have been witnessing the dictatorial way ad system IOG has been manipulating the government which has grown worst since he has been made to illegally jump to the power. The government’s failure to do its first duty which has been to protect the citizens which it instead deteriorate and become the perpetrator of arbitrary violence against the citizens. The non- existence of a ground to base the call for justice which it has made subjective, selective and in favor of him and all that have families connections and utility status relations. The parliamentarians who have been to let their voices to be heard by the community since parliament is the highest and biggest place to deliberate on all the national issues are sitting idle and cannot express their views and opinions except to adopt what is dictated and instructed by the dictator. Who elected and nominated them. How it bend the executive, the legislative and the judiciary, whichever way it wants to satisfy its whims by ignoring the country’s constitution and the constitutional power and right of the executives, legislatively and Judiciary. The executives, the legislatives, the judiciary, the authorities, the officials are praising and complimenting IOG and wife in the face of the worst blatant political suppressions. The pervasive injustice, inequality, corruption, extreme poverty, unemployment, tribalism at the lowest stage, illiteracy, absence of proper health care, oppressions, undisciplined budget, weak and dormant institutions and the worst governance on earth, yet placing itself above the community and the nation, and preaching to the citizens to warship him, in the believe that the community and the nation cannot survive without him. The breach of his oath and pledge to the constitution and the contract between him and the community for the two terms. The ignoring and refuting, the international call and consensus that African leaders must respect the constitution of their countries and refrain to change and amend the constitution to prolong their office term in order to avoid civil unrest and enhance stability peace and development. The dishonoring of our cultural democratic system, its strength and faith in its integrity that make the country no man’s land. The redundant politics of deception, hatred, despair and force. The reason why the Djiboutian people has not reacted and revolted on time against the autocratic governance of IOG has resulted from the followings. As inherited from the colonial governance which the local prime minister was assumed and acted as a typical representative of a tribe that caused the so called tribal name given earlier to the first national government due to its president, has initiated the protection and the promotion of the government through the believe of the abstract name of the tribe that made the tribe reckless about the system of governance except the existence of the name which it used to say *No matter whatever the government does or did, the name is enough*. The low tribal vision that has resulted from the lack of knowledge about the bad consequences of a tribal governance has not lasted long as it is learned and hated later times. 2. Ethiopia and Somalia are big countries and those dictators were hardly able to control and impoverish the people scattered through the cities where as in Djibouti, it is only the Djibouti city where there are employments and the other activities to survive which are all under the full control and monopoly of the totalitarian dictator. Beside this, the Djiboutian community has not got the sympathetic support and backing of its neighboring communities which the fronts that ousted the dictators of Ethiopia and Somalia got from their neighbors’. 3. The tribal civil war that torn Somalia which has resulted from the tribal governance of the ousted autocratic dictator of Somalia, who was the main teacher and trainer of the actual autocratic dictator, has became an assumed fearing and discouraging example in which IOG and his gangsters raise regularly to the people beside the false assumption that IOG is the feeder of the people whom without IOG there will be no life in Djibouti as if IOG is the creator of the people, has made the Djiboutian community to fear about the consequences of public revolt against its totalitarian dictatorship , might have induced a civil war and has used to say “A worst government is better than without government. There is no doubt that the Totalitarian dictator and his corrupted gangsters have used to terrorize the people through fear by simply pointing as an example to the civil war going on in Somalia for the last 20 years and strongly used to stress by impressing that the consequences of public uprising will no doubt transform to a civil war that initiates the complete destruction of the country and since Djibouti is a small country with only Djibouti city the people would fall in the worst agony compared to the agony the people of Somalia has fallen. In addition to these false implication, the totalitarian dictator and its gangsters used to mislead the community by raising and making them recall about the colonial dominations and the severe struggle for the independent of the country and repeatedly stress about to protect the independent that enabled us live in peace otherwise together will lose our freedom and integrity. Regardless of the propaganda of the falling totalitarian dictator who is already guilt conscious and without good conscience, we are all aware yesterday when we were more weak and less populated with no social, economic and political background and the cold war had supported and backed the colonial and dictatorial governments how our community as a whole mother, father and youths had politically struggled and achieved the independent of the country from the mightier government of the colonial because of the motivations and mobilizations carried out by the political parties and by the dedication and devotion of the youths. The way a leader acts and uses its power to play constructive or destructive role depends on the process by which a person comes to power which determines the rules of the game by which it governs. We all know that IOG has not come to the power by the will and demand of the community neither through the natural and legal process and has not climbed even the ladder according to the hierarchy within the RPP. There is nothing good to expect from such a so called leader who due to selfish grudge to the community uses his power to play destructive roles based on coercive power and the politics of hatred to govern the people by hunger. The rules of its game are revenge, harassment, and the perpetuated governance of injustice. On the other hand a local security chief whose duty has been intimidating and terrorizing the citizens, who kidnapped the wife of a honorable leader and made his wife, who never ashamed doing whatever it wanted and never respected the common doctrines of the religions has illegally governed the country upon the silence of the community. The community already knew that Mr. 10G will not serve the nation and community faith fully and with integrity but have been watching and waiting the end of its anti community assumptions, in the believe that mankind has never prospered by fraud, corruption, repression, violent abuse of power and wrong doings, but only though justice and fair dealings. Fortunately, the community has realized that the end of its target has become waging relentless war against justice and fair dealing by acting vice versa. Beside placing itself above the community and every other things and pursuing family governance, it is found endangering nativities natural citizenship and making the community to live without dignity in the native land. There is no on earth any conscious community that watches without revolting if half of what is happening in Djibouti have happened in their country. The silence and the non- reaction of the community, which the big powers and the neighboring democratic countries account as an acceptance to the bitter irony of the totalitarian dictator, is totally a mistake and wrong assumption. Any community under a totalitarian dictatorship governance is a community in a prison where every prisoners who wants, tends or speaks about the conditions and rights of the prisoners people is imprisoned in a particular cell where it is severely tortured, harassed, eliminated or deported to unknown place or escapes from the prison to foreign countries until one gives up and prostrates to the autocratic dictator or to his wife or to a close relative of the house. The Djiboutian communities are in the worst prison and are under the worst conditions but the democratic countries of the world and the democratic countries in the region have not turned their ears and attention to the people because of his false superficial propaganda and political duplicity. As we all know that the Djibouti country is only the Djibouti city since there is no economic and social development schemes aimed to develop and create job opportunities to the people in the districts ,Djibouti city which is less than half of Addis Ababa city is the place where the have mentioned above, common to every prison, there are prisoner’s gangsters, who seem to represent the prisoners cache the problems intermediate and initiate the inhuman acts against the prisoners and in the meantime praise and honor the regime in the name of the prisoners in order to promote and protect their selfish interest at the cost of their compatriots. The Djiboutian community are who strongly threatened by these gangsters would have outrageously and violently erupted like a strong active volcano and would have ended the totalitarian dictatorship governance as the dictatorial governments of Ethiopia and Somalia were ended. So as far as, the non-respect of nativities and natural citizenship means ending the claim of the home land, and living without dignity has no meaning and is intolerable, it is national obligation to react against its acts and wage a relentless war for justice in order to destroy the injustice, protect nativities and natural citizenship. The patience and tolerance of watching and waiting have ended, thus the yearning for justice to achieve equality and the remedy to the persistent problems of the dictator’s Oath breaking and violation of the spirit and the existence of the constitution show that the time is ripe for a revolution a mass revolution against the destructive governance and its illicit activities. Everything has a time and must wait its time. Now it is not the time to talk about presidential elections, it is time to talk about change, a change to safe the nation thus any politician that talks about elections is one that hankers after self-interest and abuse of power to satisfy its greed’s at the expense of the country and its compatriots, and should be considered dangerous, enemy and traitor. Furthermore, we are witnessing that his destructive role shadows his followers, Civil and military, who are all afraid what will happen to them if don’t do what they are told to do. They fear that something worse is going to happen them as the late general Yacin Yabe and Mr. Abdurrahman M.M Boreh (the most closest and most loved), if they don’t comply. So out of fear potential adverse consequences are ripe to result. What is prevailing in our small country is a replica of the governance systems which have had introduced the military coups, the instability, the public unrest and the civil wars that handicapped developments and impoverished the African community that have had resulted from the destructive governance of such so called leaders like IOG, who for money and power warship his own passions, impulses, desires and do everything to prolong its reign without limit until it makes him to face its dooms day publically. Without going far ,we know what has happened to many dictators that were mightier and stronger than 10 G are enough to be recalled as an example, such as the military dictators of Ethiopia and Somalia, and the so called democratically elected leaders of Egypt and Tunisia and how their autocratic governments has ended within days by the people . But it is something common to all dictators not to see what have happened to similar dictators and never take care not to place themselves above the law and the people until they face their doomsday which became to late to regret their vision and opinion about the people. It is known most of the successful democracies emerge from some sort of historical process as civil wars, revolutions and etc. we know the USA emerged out from a devastating civil war in the 1800s others like France, Germany, Japan etc also experienced devastating revolutions, wars and emerged from monarchy and dictator ships. In Africa Most of the democratic countries like Ethiopia, Ghana, Nigeria, Liberia, South Africa etc. have emerged from different types of dictatorship governance, while countries like Kenya which Daniel Arab Moi stayed on power for a long time has not changed or amended the constitution of the country. Experience shows us parties that stay on power over 20 years which itself is too long damage and deteriorate the economic, social and liberty and there is no a living community or society that could rely on such a deadly old mannered dictatorial system of governance for more than a term not even two. While in Djibouti the RPP stays over 33 years on the power and has totally transformed the nation to a personal property. President Jaque, Chirac said “Democracy in Africa is a luxury” and that is also true in governance. In Djibouti, the governance is not only a luxury but is also a special theatre where the so – called actor displays its feeling, passions and desires and each of the theatre participants has no a particular role to play in the theater except to display parts and acts that strongly satisfy, please and honor the so-called actor. The few citizens that inter into the politics with a desire to serve the community and a vision to improve the nation face heinous harassment, imprisonment, unemployment, intimidation, water and electricity cut off which enabled the selfish greedy, the opportunists and all those affected by the tribal complex inferiority the totalitarian dictator exercised and all the senseless ones who as he wanted attached themselves to the dictator in order to protect their interests and hanker after money and power to satisfy their selfish greed at the expense of their country and their community for whom they don’t care and have no mercy and respect, but will no doubt regret soon if they fail to realize the reality and the eternal truth. The democratic countries mentioned above are both aware about the duplicity and chameleon attitude of the dictator and what is happening in Djibouti, yet most of them seem unwilling to end the communist slogan and force it comply with the two term periods specified in the constitution, resign and vacant the position for the community. J.F Kennedy said “If a society cannot save the many that are poor, it cannot save the few who are rich”. This implies if these democratic superpowers fail to protect the constitution of one of the smallest nation on the globe in order to forge democracy. How democracy could be enforced in the bigger and multi-ethnics countries existing in Africa and in the world. The USA president Barrack Obama and his predecessor G.W Bush both said “African presidents should refrain staying on power more than two terms and will not accept any African leader who want to stay on power more than two terms period by amending or changing the constitution. Whereas now, we are witnessing its opposite. We see some officials from democratic countries talking about democracy, while the constitution is breached. The people want democracy since it is essential to have a viable political system of governance and a legitimate leader, but what is crucial is the credibility in itself. The people of Djibouti has been for 34 years imprisoned by a totalitarian dictator and his wife with family gangsters who are much worst from Ben Ali and his Leila and colleagues who without faith mislead the democratic countries with duplicity. Jimmy Carter has said * Democracy is like the experience of life itself, always changing infinite in its variety, sometimes turbulent and all the more valuable for having been tested by diversity. Unfortunately this has became impossible under the totalitarian dictator who make the country its personal property and the people its slaves by force and in the meantime imports tens of thousands from Somalia whom it calls loyal slaves who could fill the place of the Djiboutian. Therefore before democracy, Djibouti needs democratization to be put in place in order to outline the probable courses of action that would probably take the people to democracy. As every people Djibouti people need the proper functioning of democracy in the sense of leadership and representation but it has become impossible to achieve under the totalitarian dictator who have all earthy problems solved so that he will turn to the Red Planet. Now the challenge of democratizing the country in order to build democratic and responsible government need the totalitarian dictator to respect the constitution, respect the international call and consensus on the two terms, respect its oath and pledge to the constitution and to the people, stop the importation of the terrorists it aimed to subjugate the people, stop for campaigning for the illegal third term candidacy and step down in order to enable his children and family members live with the people in peace without enmity and switch off the flaming fire that by no means would lead its doomsday. We believe the democratic countries particularly the U.S.A., FRANCE and other EU members and the FDRE should stand beside the people and support their struggle to have the answer of their questions and demands. We believe without democracy there will be no peace and thus believe the victory of the people and justice to triumph over everything is always inevitable and so is to be achieved soon. Is it a leader he who nominates his fresh graduate daughter to its economic advisor and the head of the country’s economy while there are thousands of senior post graduates who are idle and depressed in the country. Such a person is irresponsible and is not a leader accepted by the community but is a so called leader who thinks will stay on the power by force. We say no and every conscious says no. Qu’ils aient ou non voté pour le maintien d’Ismaël Omar Guelleh (IOG) à la tête de l’Etat, bon nombre de Djiboutiens, surtout parmi la jeune génération, espèrent une modification en profondeur de l’équipe gouvernementale et de l’administration de leur pays. Leur attente est si forte qu’elle se réflète y compris sur les sites internet Pro-IOG, basés à l’étranger comme djibouti24.com ou le tout récente djibouti77.com (…). Depuis plusieurs mois, le site Djibouti24.com faisait librement campagne depuis l’étranger pour la réélection d’Ismaïl Omar Guelleh (IOG). (…). La société éthiopienne Green International Logistic Services (GILS) vient de créer une filiale à Djibouti sous le nom de Maple Transport. (…). Thani Group (Dubaï), holding privée dirigée par Richard Camball, songe à s’introduire en bourse. (…). Une nouvelle société de sécurité s’intéresse à la Somalie , même si les récentes proclamations de son patron, Sam Mattock, selon lesquelles sa firme va entraîner une importante force de défense maritime du Transitional Federal Government (TFG) de Mogadiscio, paraissent extrêmement optimistes. (…). La compagnie de Malaisie, qui avait tenté sa chance, il y a quelques années, en Somalie (LOI nº1208 ), vient de remporter un gros contrat en Tanzanie. (…). Le récent coup de gueule du premier ministre Meles Zenawi au Parlement (LOI nº1307 ) a fait son petit effet : (…). Alors que l’inflation est en forte progression depuis quelques mois, le premier ministre Meles Zenawi va utiliser son projet de construction d’un grand barrage hydroélectrique de 5 000 MW sur le Nil pour ponctionner une partie de la masse monétaire excédentaire en circulation dans son pays. (…). A totalitarian dictator benefited from the smallness of its country like Djibouti where there are no life opportunities and other necessary to live in the towns and villages in the regions which are aged over 120 years except the Djibouti city where the totalitarians dictator has monopolized everything from the smallest and to the biggest government and non government activities which make impossible to get a bread without its permission and knowledge that make it feel proud to act and speak without conscience and care whatever the consequences may be. The Djiboutian community has not been expecting the totalitarian dictator to respect and comply with its oath and pledge to the constitution, to the community and to the international call and consensus urging African leaders to refrain from changing or amending their countries constitution in order to prolong their governance periods after the two terms periods ends . But the Djiboutian community are aware that after the end of the cold war, dictators have no place to hide and believe the big democratic countries of the world and the democratic counties of IGAD would not accept the emergence of an autocratic governance at this millenieum, where democracy has became the only language of the world and would force every totalitarian dictator to abide the country s constitution in order to avoid civil war, .instability, destructions and promote developmental programmes. Convinced with the silence and non- intervention of the democratic counties due to lack of baseless illegibility beside globalization,. Convinced that the problem is a Djiboutian community problem that needs a Djiboutian community solution. – Being aware about the huge boycott of the people to his so-called 2nd term election which even his ministry of interior declared the abstention of 58% of the total registered voters. – Convinced by the illegal importation of over 100,000 foreign immigrants mostly from Somalia and issued the Djiboutian nationalities in order to subjugate the rights and voices of the legal citizens. – Convinced by his cynical nepotism based on his endless dissimulation and superlative arrogances which as habitual he recently nominated his fresh graduate daughter for the economic advisor of the president after he earlier nominated her to the “ General Manager post” for the construction company he usurped from Mr. Abdirahman M.M.Boreh while there are 100 s of senior post graduates who are unemployed and wondering idle in the streets of Djibouti city. – Being aware about his transgressing devilish faith favored by his extreme familiar pagans faith on witches, wizards and magician which instructed the totalitarian dictator to declare his auto proclamation for the 3rd term presidential candidacy on the 25th December 2011 and said to him “ since you are an Issa by tribe and your main and strongest opponents are the Issa tribes, Issa or Jesus(christ ) will silence and paralyses your Issa tribes when you declare your auto-proclamation on the birth day celebration of Issa (Jesus) otherwise Issa (Jesus) will be with the Issa tribes according to reliable sources from the totalitarian dictator residence. – If not so he would have waited the date prescribed for the candidates to present and declare their candidacy which again his party declared and present on March 8, 2011 that is after 2 months and 14 days after he declared his illegal candidacy. – Convinced that Issa (Jesus) and all the prophets will not side with a Satan who defected its faith and the religious faiths but always side with justice and with the people. – Convinced about the use of force against the peaceful demonstration of 18th February 2011 after the illegal time limit in which the autocratic dictator initiated the destructive acts carried out by the terrorists it imported from Somalia in order to defame and condemn the opposition leaders who were not at the site when the forces of the autocratic dictator attacked the peaceful civilians without the minimum human right care. – Convinced his recent childish irresponsible game in which he indirectly Mr. MOHAMMED WARSAME whom we are aware has quit his judiciary activities due to mental sickness and who was the president of the constitution that legalized the illegal legitimacy of the second term of totalitarian dictator and helped rig the so called legislative elections to an independent contender in the so called presidential election. Thus due to this critical situation persistently prevalent to initiate the immediate destruction of the country and in the believe that ALLAH (GOD) do not foolish any people or community nor created and make them without dignity unless they themselves foolish themselves and make themselves without dignity, has make the creation of this front necessary and pertinent in order to forge a peoples solution to the overwhelming problems that have been existing in country for 34 years of the RPPs autocratic dictatorship governance. We are neither a part nor its founders or member of any of the political parties that are united under the umbrella of U.A.D and UMD but it strongly supports and backs their peaceful struggle against the breach to the oath and pledge to the constitution after the autocratic dictator auto-proclaimed a 3rd term so-called presidential candidacy. We are aware and know about the bad consequences of war. It urges the autocratic dictator resign in comply with two terms periods and end its greediness for power for the peace of the country to avoid all sorts of rebellions. The PNRFD believes and recognizes the presence of all the foreign troops are an excellent special fortunes to our community and country thus the front strongly supports the legitimate wars against all forms of terrorist and pirates and is firmly against the opinion, view and policy of the autocratic dictator IOG who bases his policy toward terrorists on reason while terrorists have no ground or reason to base their terrorist acts. B) taking an overall responsibility to put in place a coordinated response to end the autocratic government of the totalitarian dictator. D) Pursuing a national frame work that unites the community to realize its responsibility and jointly fight against the destructive governance of the autocratic dictator. The determination and dedication of the PNRFD is standing as a beacon of hope for the community and the nation to create a free community sharing the resources of the country equally and for better tomorrow. Therefore the PNRFD requests the FDRE, the main homeland of the Afars and Issas, Frances, the father of the country, the U.S.A the father and pioneer of the world democracy, the democratic country in the region and the international community to support and stand shoulder to shoulder with the community to force the autocratic dictator abide to the constitution of the country and vacant the position in order to democratize the country and let the community achieve a peaceful solution and decide about their destiny. Let us join hands in hands to put soon in place the longed hope of the community and the region by ending and substituting the politics of duplicity and hatred with mutual trust ship that could enable as work together and create better future that is free from bad government hostilities and all others that are against the will of the Djiboutian community as well the will of the neighboring communities in particular with the democratic peoples of the FDRE. – Down the totalitarian dictators in the region, in Africa and in the world. confronté à la suprématie de la Police"
La prépondérance de la Police et les épreuves que subissent les réfugiés dans les camps mais aussi dans la capitale ! Cette prépondérance de la Police est tout à fait contraire au rôle de la Police, en principe chargée de la protection des r éfugiés et du soutien humanitaire en faveur de ces personnes fragilisées. A entendre les paroles et le ton insolent devant la Cour correctionnelle de l’Adjudant Abdillahi Farah Mohamed connu par les réfugiés de la Somalie du sud au camp d’Ali Adeh non loin d’Ali Sabieh, il est difficile de ne pas constater l’une des formes de violations récurrentes des droits des justiciables. Au cours de ces deux dernières années dans le cadre de la mise en place du Coup d’Etat électoral du 8 avril 2011, on assiste à une « passivité quasi-systématique de la part du pouvoir judiciaire face aux dénonciations de pratiques de torture par des agents de l’Etat lors des interrogations, des arrestations, ou en détention. Les enquêtes et les poursuites à l’encontre d’agents accusés de ces crimes sont quasiment inexistantes ». La Ligue Djiboutienne des Droits Humains (LDDH) diffusera, dans les jours qui suivent, le rapport de la FIDH sur l’instrumentalisation de la Justice et mettra en relief les points comparatifs avec notre Justice. Aucun Syndicat de la Magistrature dans notre pays et un Parquet de la République, qu’il est normal de considérer comme l’un des « complices silencieux » du pouvoir. A notre connaissance il n’a jamais déclenché de poursuites pour crimes de disparition forcée, de crimes de Torture, de détention et de garde à vue arbitraire, de violations de domicile abusive ou de rafles brutales, incontrôlées et quotidiennes. Aujourd’hui, jeudi 28 avril 2011, l’affaire du réfugié de Mogadiscio a été renvoyée au 5 mai 2011, à la demande du Cabinet de Maître Dini absent du Territoire. La vraie victime dont les cicatrices ont été montrées en pleine audience la semaine dernière a mis en relief le fait qu’il a été dépouillé de tout son argent en sa possession, avant d’être battu farouchement directement dans le Camp d’Ali Addé. La disparition de son fils mineur a été soulevée, par la Police ou ? La LDDH réitère sa demande au HCR de Djibouti de suivre ce procès inique, dilatoire et de prendre soins du réfugié Abdi Nour Ali Omar encore arbitrairement incarcéré et de faire appel à un Médecin pour le consulter, afin de prouver au monde entier les agissements intolérables de certains éléments de la Police et de la Gendarmerie, qui outrepassent leur prérogatives d’institutions républicaines. 29/04/11 (B601) LDDH : Un mort dans la Brigade de la Gendarmerie de Cheick Osman… pour une dette civile de 15.000 FDj !!! NOTE D’INFORMATION DU 29 AVRIL 2011.
pour une dette civile de 15.000 FDj !!! La Ligue Djiboutienne des Droits Humains (LDDH) a appris avec stupéfaction la mort de M. Dirir Ibrahim Bouraleh dans les locaux de la Gendarmerie de Cheick Osman. plainte et de prendre si ses moyens le permettent l’assistance d’un avocat. somme de quinze mille francs Djibouti. Après deux jours de garde à vue, probablement sans l’autorisation du Parquet, le frère de la victime Monsieur Ali Ibrahim Bouraleh est venu à la Gendarmerie pour payer les 15.000 FD. Il a vu le Commandant de la Brigade de la Gendarmerie l’Adjudant Chef Abdourahman Omar Saïd, qui a refusé d’accepter le règlement à l’amiable de cette dette. Après quatre jours de garde à vue dans des conditions insoutenables, la victime est décédée. Son corps n’a pas été, jusqu’à présent, remis à la famille, bien que le Procureur ait du constater la mort. Ce père de cinq enfants et d’un sixième en cours se trouve toujours à la morgue de l’Hôpital et la famille ne sait plus quoi faire. A combien se chiffre le nombre de disparitions forcées, et de décès dans les cellules de la Gendarmerie ? La Ligue Djiboutienne des Droits Humains (LDDH) lance un appel à tous ses compatriotes dans la mesure du possible de collaborer avec nous Défenseurs des Droits de l’Homme, pour que nous puissions, noms, dates et lieux à l’appui saisir les organisations internationales pour la Défense des Droits de l’Homme et de l’Observatoire des Prisons et lieux de détentions secrètes et illégales, l’observatoire des Défenseurs des Droits de l’Homme et de l’Organisation contre la Torture et les Disparitions Forcées. 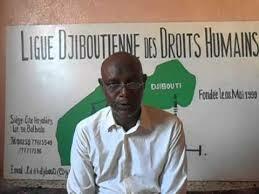 La Ligue Djiboutienne des Droits Humains (LDDH) suit avec attention cette Affaire. http://ardhd.org/wp-content/uploads/2018/05/logo_wp.png 0 0 jlschaal http://ardhd.org/wp-content/uploads/2018/05/logo_wp.png jlschaal2011-04-29 00:00:002011-04-29 00:00:0029/04/11 (B601) LDDH : Un mort dans la Brigade de la Gendarmerie de Cheick Osman… pour une dette civile de 15.000 FDj !!! En fait notre « Rigoletto local » Hachi a envoyé 12.000 US$ au Sergent chef Bakal (un proche d’IOG). Cette somme représente son cadeau de remerciements à la diapsora djiboutienne qui avait du danser pour soutenir tant bien que mal, sa campagne chaotique. L’ex-Sergent Bakal a bien réceptionné les 12.000 US$. il a gardé 5.000 US$ pour lui. Mais le reste soit 7.000 US$ est toujours dans sa poche. Il aurait affirmé à l’ancienne épouse de Djama Haid, Kadra Igueh qu’Hachi ne lui avait envoyé que 7.000 US$. Furieuse, car elle savait que le Sergent Bakal mentait éffrontément, Kadra Igueh a téléphone à Paulette, qui lui a confirmé que ce n’était pas 7.000 US$ mais bien 12.000 US$ que son « seigneur et maître » le gros IOG avait fait envoyer afin que la communauté « bien votante » du Canada puisse organiser une fête mémorable qui devra être restransmise pour tous les Djiboutiens du pays. De plus en plus en colère, Kadra Igueh aurait contacté le Sergent Bakal pour lui dire qu’elle avait eu la confirmation personnelle de Kadra Haid (RPP) que la somme envoyée était à hauteur de 12.000 US$ et elle lui a demandé où étaient passés les 5.000 US$ manquants. Horriblement embarrassé Bakal n’a pas su trouver ses mots et il s’est emberlificoté dans ses mensonges. Bakal a essayé de calmer Kadra Igueh dont la colère montait. Au sein du comité, on trouve des Djiboutiens comme Rachid Chien, Fadouma Ismail Youssouf Wahdade (Cette femme gère le restaurant Maskali qui est trés frequenté par la diaspora) et Zakaria qui cumule deux fonctions : d’abord, il est l’oeil de la securité djiboutienne à Montreal mais il est aussi le grand organisateur des événements « iogiens ». Le comité n’a pas accepté les 7.000 US$ et il demande l’intégralité. Il faut que la fête qu’ils doivent organiser pour ce renard d’IOG, soit resplendissante. Mais … Bakal refuse de rendre l’argent et il menace les membres du comité de les faire expulser au cas où ils maintiendraient leurs exigences contre lui. Le comité a refusé de se plier à ce chantage. C’est donc l’impasse. Bakal a volé 5.000 US$. A Djibouti de problème dérange beaucoup. IOG a demandé à Hachi de lui dire à qui il avait envoyé l’argent. Il lui a répondu qu’il avait envoyé la somme de 12.000 US$ à Bakal, via Dahabshil d’Ottawa. IOG est absolument furieux mais il se tait. Au moment où nous publions cet article, le comité n’arrive pas à adopter une attitude commune. Certains exigent que l’intégralité de la somme soit remise au comité (12.000 US$) tandis que Bakal jure qu’il n’a en poche que 7.000 US$. La date de la troisième intronisation de notre « ougaas » iog est confirmée. Ce sera le 7 mai 2011 au cours d’une cérémonie organisée au palais du peuple. IOG a déjà fait envoyer des lettres d invitations à des chefs d’Etat, dont certains ne sont pas du tout « fréquentables » !!! Afin de donner un nouveau coup de massue au peuple qui le rejette, IOG va faire croire aux djiboutiens que tous les pays étrangers le reconnaissent comme le seul Président légitime. Le 7 mai s’approche pourtant. Le comité a refusé de siéger tant que l’ex-sergent Bakal de la FNS ne rend pas tout l’argent. (rappelons que c’est ce Sergent qui avait fait passer l’examen de Francais au Colonel ‘berger’ Mohamed Djama Doualeh de la Garde républicaine qui, élevé en brousse ne connaissait pas le moindre mot de la langue de Molière). Le régime de Guelleh ne sait plus quoi faire pour résoudre le problème. Il faut savoir que l’argent envoyé par IOG à Londres, a aussi été détourné. Le voleur volé ??? On ne peut pas dire que les Dieux soient avec IOG en ce moment ! est gaspillé par une bande de voleurs.